Just a quick note about an article by Paul Krugman that appeared on his blog today. Krugman posits that the increase in government spending is mainly due to two factors. 1 - Since the economy has contracted, government spending is going to make up a larger percentage of GDP. Pretty straight forward. 2 - More people are unemployed and are thus collecting from various social safety nets: unemployment, medicaid, food stamps, etc. The blue line is government (at all levels) spending as a percentage of GDP, so in the last 25 years it was fairly consistently was between 31%-34% of GDP. I'll also note it fell under Clinton and rose during W, although not by too much. Today it's 36%, actually not that high, relatively speaking. 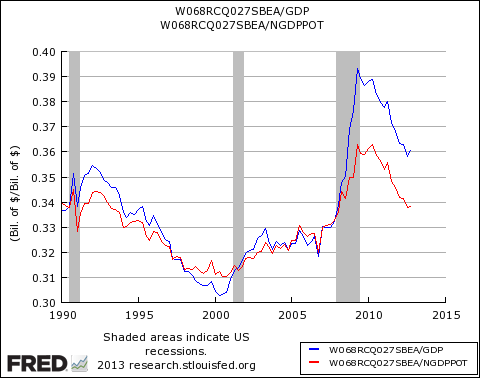 The red line is this same measure but as it relates to potential GDP. Basically, what our economy can and should produce. This number is about 34% which is much closer to the trend for the last 25 years. So there has been some increase in government (again, this is all levels of government, not just federal) spending, but a large portion of it is clearly due to our economy contracting (red line). If one considers #2 from above then it becomes clear that our government, sans safety net programs, has actually contracted in the last several years. This is extremely troubling. In "data", "economics", "economy", "krugman", "unemployment"